What Is A Mother Of Pearl Tile? Bet you didn’t think that shells will find a way into your home as a decor, right? Truth is, you’ll be contributing to the preservation of Mother Earth when you choose to go green with shell tiles. They make your floor or wall extraordinarily lustrous and natural-looking. Have you ever heard of mother of pearl? Well it’s the shiny inner surface of shells particularly abalone, oysters and so on. Mother of pearl tile, also known by its other name - shell mosaic tile, is one hundred percent natural, and polished and processed by hand. A skilled craftsman can actually turn these materials into different forms like scallops, spirals, snails, among others. Fortunately, they come in wide range of colour, lustre and size. More and more people now prefer shell mosaics for their distinct classic beauty that no other tile material can provide. Perfect as a kitchen tile accent and as a bathroom tile backsplash, said products will give your bathroom or kitchen the iridescence and lustre of mother of pearl. The materials could really be affordable hence if you want a full iridescent wall but, are kind of short of budget, the wise use of shell mosaic tiles can add sparkle to an accent. Make your home shine with them including your side table, mirror frames and the like. Of course we are quite aware that these items go well for exterior (like in canopies or porch covers) and interior walls as well. Also good for interior floors with light traffic, shell mosaics are widely used in tabletops, countertops, shower walls, bathroom backsplashes, tub surroundings, even ceilings. Add glamour and extra shimmer to your bathroom by installing a feature strip of shell mosaics, without hurting your pocket. These days, modern hotels, offices, bars, company halls, exclusive clubs, sports centres are decorated with mother of pearl tiles. In homes, these items give that extra sparkle not only to walls and ceilings but also to domes, columns, lavatories, garden landscapes and swimming pools. ExoTiles’ selection of natural sea shell mixed with glass mosaic tiles is far from limited. Very suitable for any indoor wall applications like bathroom walls or kitchen splashback, our products are hand-made and customised based on your requirements. Good thing – we don’t only sell but, we also provide professional advice and support to our dear customers. Browse the gallery for designs and give us a call. Let our team help you make a good decision when buying bathroom and kitchen tiles. Ever thought of putting mosaics and stone tiles in your kitchen and bathroom backsplashes? Then, that would be the most perfect idea to complete your home renovation. If your walls have already become an eyesore, then transform them by refinishing with stone and glass mosaics. Stone and glass tiles can certainly enhance the look of your bathroom with their sleekness. Incredibly durable, natural stone mosaics can further, make an ideal choice in completing your home. The soft hues make for the versatility of natural stone mosaic tiles as these can be used in all the rooms around your house. What better way of getting natural stone mosaics than by contacting an online store like ExoTiles? Ours is a large selection with a variety of designs and types to choose from. These include onyx, pebble, travertine and marble mosaic tiles, all hand-made and can be customised according to your specifications. Choosing between the two could be a bit daunting. Before finally deciding what tile to use, bear in mind there are certain factors to consider. Attractiveness? Yes, both have similarly beautiful outcomes besides their being easy-to-clean as well as their suitability of use in wet zones. Well, glass tile have this soft sheen that ceramic and stone tiles do not have. The lustre gives a distinct glow making your space bright. Translucent and shimmery, not to mention water-resistant, glass tiles come in neutral and bold colours. Use them in your bathroom and be amazed at the bold statement it produces. A nice sparkling idea would be to turn your sink and vanity into a central point with such materials. Alternatively, you can also use glass tiles as a subtle backdrop to provide prominence to the other design elements in your bathroom. As for stones, they may be polished but will still look natural with its colour. Granite tiles or river-rock stone can be polished because if not, they will look rough. Consult the professionals at ExoTiles to know if your stone will need a sealer coat to prevent stains and water marks. Glass and stone tiles come glued to a mesh ready to be installed. Ask ExoTiles on how to get creative with your layout. For more interesting bathroom and kitchen tile ideas, browse the pages of this site. So many different types of tiles are made available today and they come with a variety of purposes. If you want your project to be right, then choose the appropriate types. If you think that only bathrooms and kitchens are tiled or decorated with murals in the past, think again. Today, almost every room in your house can have attractive tiles in them. Mural mosaic tiles can now be found as decorations in bedrooms, living rooms, in swimming pools and so on. Think about this: if you tile your walls rather than use those alternative coverings, what a beautiful inspiration you will have right in your own home. Exotiles, the leading online tile supplier in Australia offers a wide selection of decorative wall tile murals, even single tile accents. Be glad to know that our products suit a range of wall applications. And these include - a feature wall, bathroom walls, splashbacks and more. Our tiles are all hand-made piece by piece. 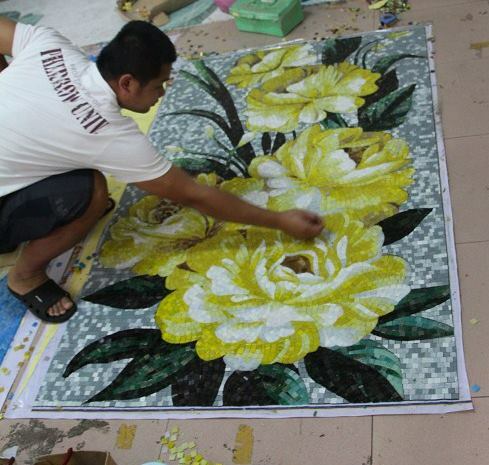 Mosaic mural designs can be customised depending on your specification, and it’s only for you and your precious home. Find a gorgeous selection of art and designs which you can’t find anywhere else. Learn from the professionals about various options for breath-taking tile projects. What’s more, we can refer you to skilled artists and designers that can turn the best photo you own into a tile mural of accent tile. You’re free to choose from smooth surface ceramic, to glass tiles or tumbled marble natural stone tiles, and more. With a decorative wall tile mural added, your home can really create a statement. If you want a reproduction of original artwork, scenery, paintings, landscape, drawings, whatever it is that inspires you, then you’re going to have it, if that’s what you really want it to be, and more. 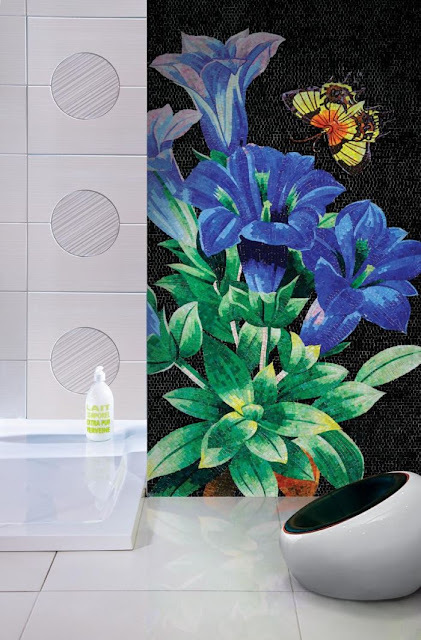 Let your friends and guests admire your personal taste and style with decorative wall tile murals and accent pieces from ExoTiles. You’ll be astonished with our large number of tile mural selections for kitchens, backsplashes and bathrooms. Tile murals can be applied to backsplashes on kitchen sink or behind the stove, in the shower or tub, on tabletops, countertops, even around your swimming pool. Choose your own tile mural and backsplash designs when remodelling your home or building, and savour the lasting beauty a tile mural gives you. Visit our Facebook page to have a great view of our product line. Browse our pages for a quickoverview of the kitchen and bathroom tiles types we offer. Mosaic Tile For The Bathroom? Why not? Haven’t you tried it yet? Don’t be left in the dust. Be modern. Be chic. Go mosaic for your bathroom. Perhaps you may have heard some interesting facts about mosaic tiles. Your entire home will certainly look very attractive with them, not only your bathroom. Bet you might have known that these materials only look best in backsplashes in bathrooms and kitchens, adding colour, providing fun and zest. Sad to note, not too many people are aware of the benefits of mosaic tiles in bathroom as well as other spaces in your home. Not only are mosaic tiles a fantastic way to add a splash of colour to or highlight your bigger tile. Rather, they also give a really gorgeous visual pop to your bathroom, or any room for that matter. There’s nothing more aesthetically fulfilling than seeing an eye-catching collage composed of tiny tiles forming an intricate and cohesive pattern. Versatile as they are, mosaic tiles can be installed in practically all rooms in the house, not only bathrooms and kitchens. You can go as far as your creativity will bring you. Use them for backsplashes, on countertops, in the showers, even outside the house like the entryways. Visit our store today to see our complete line of assorted tiles. We provide lots of interesting options to help you create your own magnificent patterns. With just the right mix of sections of pre-meshed glass, granite, marble, slate or travertine, and you design something that can make a room brighter and wider. The very luminescent nature of glass mosaic tiles enables them to reflect light to brighten up your room. Their non-porosity make them stain, mould and mildew-resistant. Further, grime stains on glass tiles are no problem either. You can clean them easily by wiping them with a damp washcloth. Once you see a build-up of soap scum in your bathroom, clean it up using a mild vinegar solution. What’s more, if an individual tile on the mesh is damaged, simply cut the bad tile out and replace it with an extra tile. If you didn't know it yet, yes mosaic tiles can be blended. A popular trend in home interior designing today is the blending of glass tiles and mosaics, which many consider a very fashionable option. According to ‘beauty experts’ in the construction industry, the biggest advantage of using mosaic glass tiles is the stunning look that can only be achieved with an accurate installation. A certified tiler can expertly produce intricate patterns by just simply arranging glass tiles or a mix of glass and natural stone. For more interesting bathroom tile ideas, you need not look farther and beyond. ExoTiles is just a click away. Browse the pages of this website. Wall Tile Idea – Why Not Glass Mosaics? Need a room makeover in your own home? Yes, you can and don’t make it just an ordinary one. Choose mosaic tiles - a practical and exquisite covering for the walls in your bathroom and kitchen backsplashes as well. Yes, why not mosaic tiles? They make for a colourful and cheerful décor for rooms and other spaces in your house. Good news is, they come in various materials – stone, ceramic, glass, sea shell or stainless steel so you really have a lot of beautiful arrays to choose from. If you want your walls to carry an impactful design, then mosaic it is. By just replacing a tile or two here and there in your kitchen or bathroom with attractively-designed mosaic tiles and VOILÀ! You come up with a stunning creation! These materials are extensively offered in a wide variety of colours. Meaning, you can always pick something that suits your taste – and budget. Besides being fun to work with, mosaic tiles are now readily available within easy reach. Just make sure though, to shop around and get the best deals. Otherwise, you can come visit our gallery for alluring and pretty tile ideas for walls, floors, ceilings, roof and anywhere else. You can be creative with any mosaic styles and design any look you desire with them. Glass mosaics are cheaper than stone and about the same price as ceramic. Many are now using it to create great mosaic masterpieces. Because glass is quite solid once the tile is laid, this wouldn't scratch under normal use. A multitude of attractive looks - As mentioned earlier, you can have an endless creativity with glass mosaics. Choose the right size, colour, the suitable mix – and that depends on your budget. For a more interesting outcome, combine glass mosaics with ceramic or stone and you get a more well-defined look. A larger and more vibrant feel - Glass tiles reflect light, the reason why your room will look bigger and brighter. Your indoor ambiance will truly be enhanced with glass mosaics. When done right, be assured of a unique charm and elegance to your rooms. To be sure, always consult a professional tiler in your area. Otherwise, contact ExoTiles and never go wrong with your installation. Tiles are only as strong as the base in which they sit atop of so until glass mosaic tiles are laid they are vulnerable. Glass is without a doubt, fragile. So, utmost care must be observed when handling such material. For all its benefits, why worry when there’s ExoTiles that can make things easier for you? We know of qualified experts who can provide you with plenty of wall tile ideas. Give us a call today so we can start to move things up, that is – beautify your home. ExoTiles can now supply custom made marble floor features and deliver to anywhere in the world. Waterjet marble 'medallions' as they are called are made using a computer controlled machine which cuts the stone with a very fine jet of high pressure water. The waterjet can cut stone of thickness's up to 35mm with ease. This method allows for very high levels of accuracy, so much so, that the pieces will slot together like a jigsaw puzzle with no gaps at all. These tiles can be made from solid stone or a composite of stone bonded to an underside layer of ceramic. Composite made medallions are cheaper and equally strong. Some people do not like the idea of it being glued to ceramic so they can choose to have it made from 100% stone if they wish. These marble medallions are ideal for hotel lobby, shopping centre, hospital or many other applications. Designs can be custom made including logos or anything else. Check out the Mural Mosaic category on the ExoTiles website for a guide on pricing. Here's some videos of how it works. Real marble tiles look unique and beautiful as it comes in shades variations and whirling patterns and therefore you need to be careful at the time of installing these tiles to ensure that only the same patterns marble tiles are used for decorating your garden. You should get the tiles from same original batch to make sure that the pattern matches with each other. Marble tiles like the rest of the stone tiles also need high maintenance and thus you need to clean and seal it regularly. While cleaning, you should use mild detergents or products that have been designed for marble. If you are wondering about the best ways todecorate your garden with tiles than you will need to follow these tips. It is not essential that bigger tiles are better but it is a fact that bigger tiles can be installed easily. If you have large tiles for your garden, the installation process simpler and quicker as compared to the smaller tiles. Thus you need to select the pattern that you like so that you can get it installed in your garden for enhancing its overall appeal. It is also very important to have a flat subfloor in order to have a successful installation. You can also have self leveling subfloor compound, if you want to install the tiles in your garden yourself. The other very good options are cement or plywood backer board. You should have a minimum one inch thick subfloor to have successful and best quality installation. Thin set is used for keeping tiles up on floor as it also helps in avoiding imperfections on the subfloor. There are a large variety of thin sets that are used for the application of the tiles but latex modified thin set are ideal for ceramic tiles. These sets only need water so the successful installation of the ceramic tiles. But you should only mix the quantity that is required or that you will use within one hour of mixing otherwise the installation job becomes very difficult. If there are cutting corners in your garden then you will need to rent wet saw for cutting the tiles. If you desire to have a modern and unique look for the paving project in your garden then you will need the help ofnatural stone tiles and pavers. This is a very high quality product which comes in a large variety of colors of this natural stones like limestone, sandstone, granite and travertine. It adds a touch of uniqueness and beauty to your garden along with enhancing the overall appeal of your home. You should always devote quality time for the installation of the tiles as if you are in a hurry, the job can be spoilt. If you want to create perfect gaps in between the tiles you will need to user plastic spacers that come in different sizes relating to the sizes of the tiles. You should always have extra tiles in case if tiles breakdown during installation as ceramic tiles are very brittle and with a hit from a hard object it tends to break down. Does Health Improvement Arrive Along with Technology Development?